At its core, time tracking is about understanding how much time we spend doing the things that are truly meaningful. Accurate time tracking is all about the details ̶ the details that weave the work we do into the larger picture. If you think about it, time tracking is an action as well as a noun ̶ when we “track time”, those little chunks of time blocks we see stack up, much in the way that bricks do, to build an entire house. Or, in this case, to progress a goal towards fruition. So how does time tracking work? Time tracking is not just a modern-day concept. Nor is it only used for freelancers, teams in businesses, or as a measure of productivity on a proverbial assembly line. It’s useful and crucial through all aspects of our lives. You can always make more money ̶ but you can’t make more time. Ever driven a Ford car? You have Henry Ford to thank for modern-day time tracking. Or, perhaps we can take it back even further and credit Frederick Taylor, the brains behind the idea of 20th century “scientific management”. At its birth, industrial society was vast and needed major management. Taylorism, as it was more widely known, became a useful way to track improved economic efficiency as it connected to the productivity output of laborers. In other words, it was a neat way of abstracting the work of individuals and then connecting it to a measurement of time, cost, and revenue. Not so far off from what we do in today’s organizations, right? The concept of “punching in” and “punching out” came from this very same era and societal epoch. It was a way to keep track of employees’ productivity and to ensure that every worker was available, present, accounted for, and most importantly, stationed at their position on the assembly line. Like a cog in a well-oiled machine, the unaccounted absence or tardiness of even one of these workers could result in a huge loss or mishap for the business. So why is Ford connected so deeply to the principles of scientific management and time-tracking? He was the one who systematized time-tracking and connected it to the way that workers perform on an assembly line, accounting for each moment in their day and keeping track of where they were on the floor. In an era of mass production, time was of the essence. At first, workers would grumble at having to punch in and out. It felt like a coercion of their time. And, in the 90s era of cubicles and call-centers, time-tracking conjured up images of managers and supervisors breathing down workers’ necks, trying to squeeze out every ounce of “productivity” from them while they were “on the clock”. In other words, it was an ownership of time. And the owners were not employees or workers, by the way. But, today, the tables have turned: the way we do it now, time tracking has become a crucial aspect of personal and professional development, critical to business success. 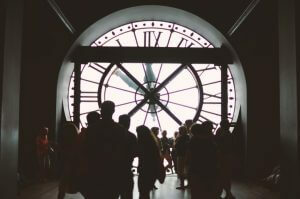 Fast forward a century later and we rely deeply on time tracking ̶ both as a method of personal evaluation and habit-building, as well as in our roles as employees. You see, industrial society eventually gave way to the post-industrial society, the knowledge economy and, as we call it today, the “gig” economy ̶ and in the “gig” economy, workers are taking back their time. It’s now their responsibility (rather than an externally-imposed obligation) to track their hours so they can submit them via timesheets or through invoices. In other words, time tracking has now become a matter of empowerment. Time tracking brings a new level of awareness during a moment in our society where we’re trying hard to maintain a balance and we’re undergoing major technological shifts. On the one hand, these tech-based shifts simplify and automate our lives, freeing up our time from menial, and otherwise repetitive, tasks. On the other hand, we’ve simply added even more commitments to our calendar, thanks to this added or regained time. Here’s the clincher: If we don’t use the information that time tracking reveals to us ̶ the actual, hard data points ̶ the initiative is completely useless. The action of time tracking is just one-half of the picture. Motivation and engagement: When management staff tracks time in conjunction with employees, it provides a huge motivation and incentive for employees because the practice becomes less about oversight and more about improvement. Insight: Businesses receive deep insight into their most profitable actions, as well as their most productive time periods and/or activities. Work-life balance: Individuals can better understand how to organize their lives around work, leading to a better overall work-life balance. Clarity: Both in organizations as well as small teams, the statement, “I don’t know” in response to “Where/how can we do better in [project delivery/value of work/cost estimations, etc. ]” is effectively eliminated ̶ in other words, there is clarity. So how does time tracking work again? In our modern-day context, pretty seamlessly, would be the answer. We’ve come a long way from the days of tracked hours and productivity as a “carrot-and-the-stick”, reward-and-punishment based system. Today, we use time tracking as a means of incremental improvement, company goals, and revenue growth. In other words, time tracking is the critical building block to progress and profit.